More fitting for Guards than most historical uniforms! Well done - waiting for the next discovery. Ah - good to see the templates being used. I was beginning to wonder if I would see them in use again as no blogs that I know of have posted any for quite some time. I look forward to seeing the rest. - color: purple (to keep with the rest of the Guard infantry) with forester green facings? May be ... audacious, specially for jagers -but light troops were often more glamorous than line ones. Or green with purple facings? There are surprisingly far more 18th C. 25-28mm Spanish minis that one would believe, according to the scarcity of their appearance, at least in fictitious armies. 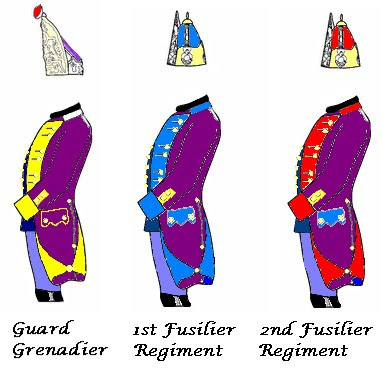 The vest partly concealed under a cloak of 'pyrenean' light infantry, or the very short jacket of 'Black' troops, would probably be more propicious than a large justaucorps to the use of purple as the basis color! Jean-Louis, I like the idea of using the Arquebusiers de Grassin for Guard jager. I did see the Eureka Miniatures "100 Club" figurines and was tempted even back then! The Spanishs "Miñones' (miquelets in French, 'Cazadores de Montaña') could provide 'ordinary' skirmishers: by adding 1 - 1.5mm (for 28mm minis / 'thick paint' conversion?) of 'socks' above the lower limit of the breeches as sculpted in a mini with 'alpargatas', they immediatly look like the typical / traditional Bulgarian leggear (as worn by the Bulgarian reservists at the start of WW1). The minis would look 'Centre-European' rather than Spanish!